The Tenth Frame Boost Double Tote Plus is a great bag for toting 2 bowling balls, accessories, and shoes to the lanes. 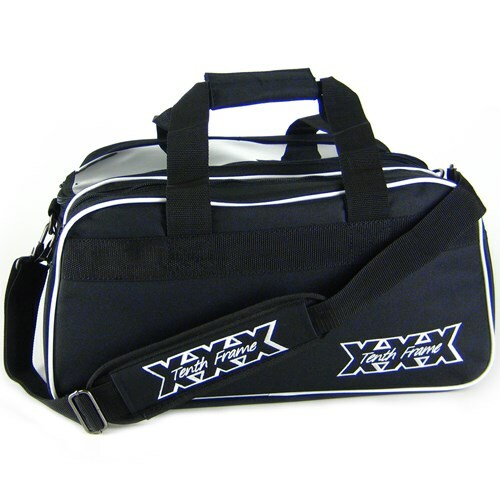 This bag is made of heavy duty fabric and has a clear top panel for easily identifying the bowling balls inside as well as a large accessory pocket. You can carry this bag using the padded handles or the adjustable shoulder strap. What are the dimensions? L x W x H? It is 18 x 10 x 2. Due to the time it takes to produce the Tenth Frame Boost Double Tote Plus Black ball it will ship in immediately. We cannot ship this ball outside the United States.